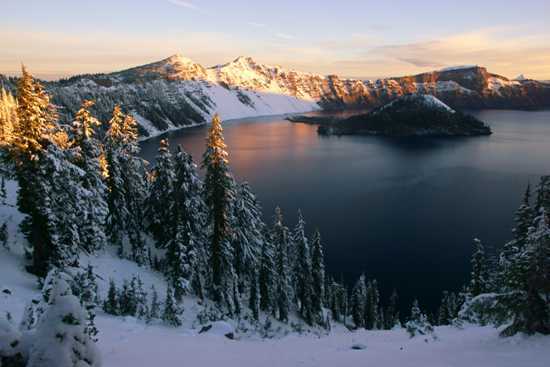 There’s no bad time of the year to visit Crater Lake National Park, but certain times are a heck of a lot better than others. 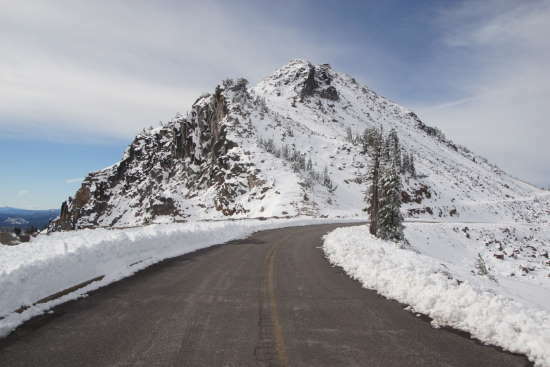 For most of the year, heavy snowfall forces the park to close the Rim Drive — a 33-mile road that loops around the lake, providing access to numerous viewpoints and trails. 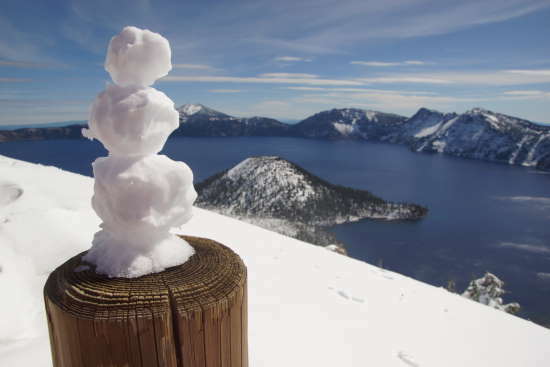 If it’s fall, or winter, or spring, you should definitely visit Crater Lake. But, if you have your choice, choose summer, when the entire road is open. 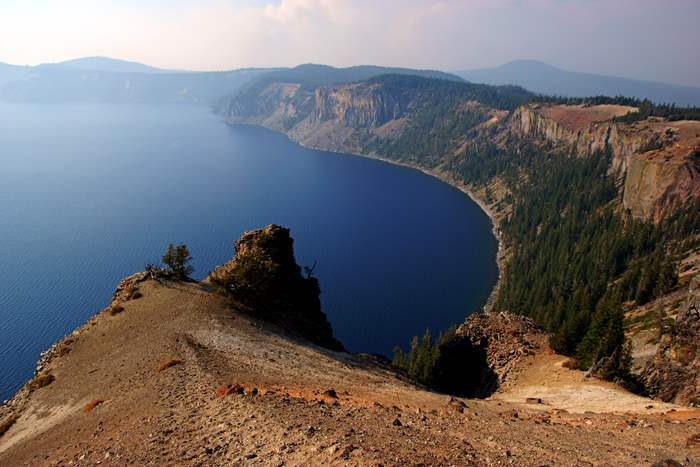 Crater Lake is located in south-central Oregon. 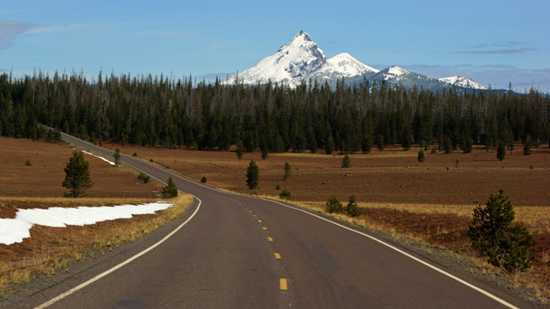 Access to the loop drive is provided by just two roads: from the south, via Oregon Route 62, and from the north, via Oregon Route 138. From fall to late spring (or even early summer), the northern entrance may be closed. The park attempts to keep the southern entrance open year-round — but you’ll only be able to access the rim at one viewpoint. 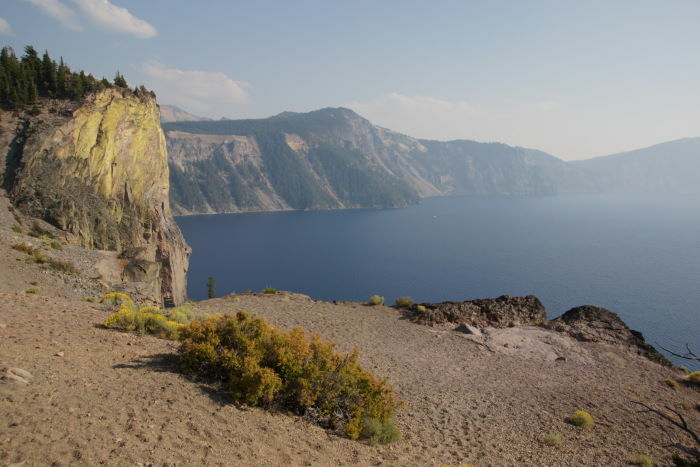 My visit to Crater Lake in August, 2015, started with a frantic drive from Roseburg, Oregon, to get to Cleetwood Cove on time. I had reservations for a boat ride out to Wizard Island, and I didn’t want to be late. 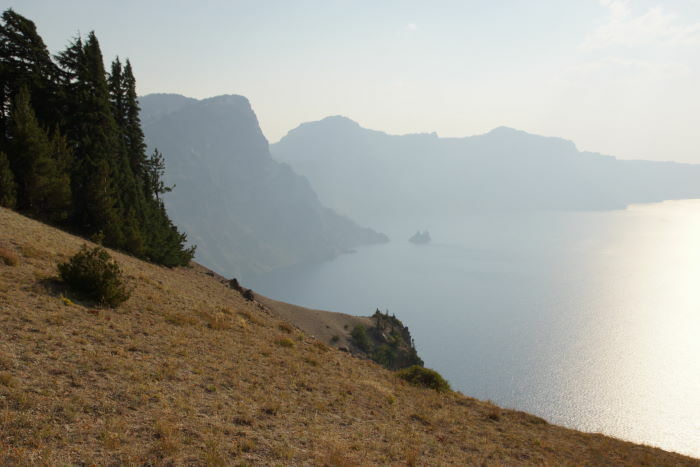 Unfortunately, some serious wildfires near Crater Lake forced the closure of the north entrance, which meant I had to take a very long detour from Roseburg south, then east, then north, and circle half the lake to get to Cleetwood Cove (and yes, I made it on time, but just barely). After the boat ride, I made two full loops around the lake, just to make sure I didn’t miss anything. For the purpose of this tour, I’m going to start at the southern entrance and take you clockwise around the lake. 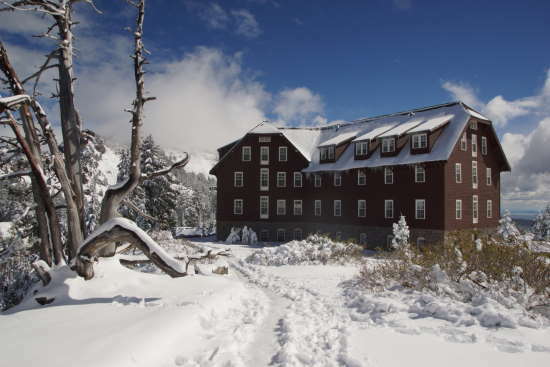 …and accommodations at the Crater Lake Lodge. The gift shop should be open year-round, while the hotel is summertime only. At Rim Village, you’ll find numerous places to view the lake, looking north. It’s especially great at sunrise. The best views are from Garfield Peak — reached by a moderately challenging hike that begins on the far side of the lodge. 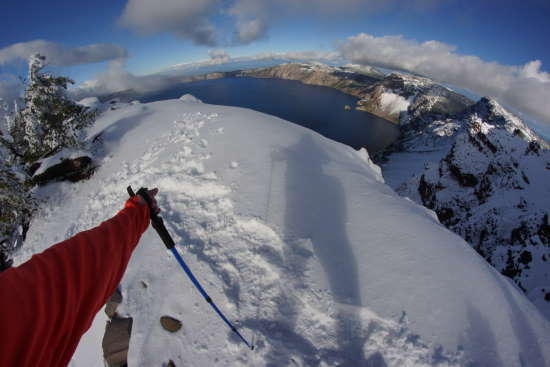 I did this hike in September, 2013, despite the early arrival of wintertime at the lake (early for the rest of the country, but on-time for Crater Lake). 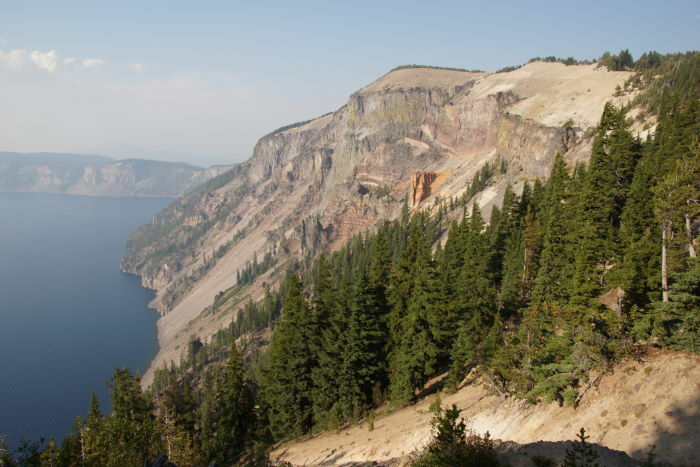 The Rim Road opens in two parts — the west side, and the rest of it. If you’ve arrived just a few days after an early-season snowstorm, there’s a chance that the west side of the loop will be open, along with the northern entrance, but most of the drive will still be closed. Likewise, by June, it’s possible the west side will be open, while the remainder of the loop is being plowed. 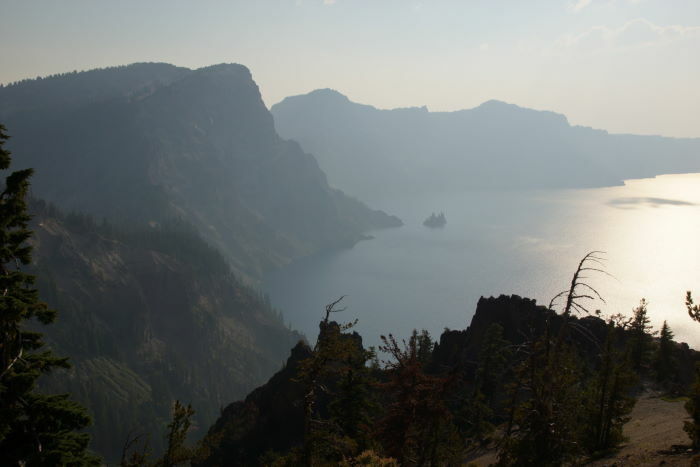 As you head up the west side from the Rim Village, there are a few good viewpoints. 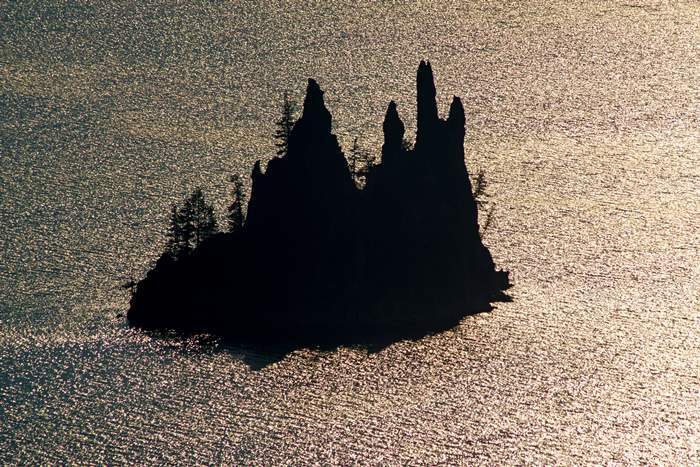 At Discovery Point, you’re getting pretty close to Wizard Island. You’ll also have a nice view looking back in the direction of the Rim Village. 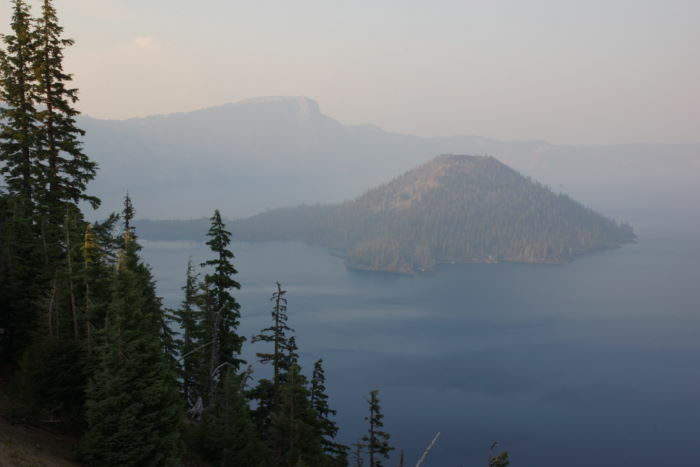 Please pardon the hazy skies — it was all because of those darned wildfires! 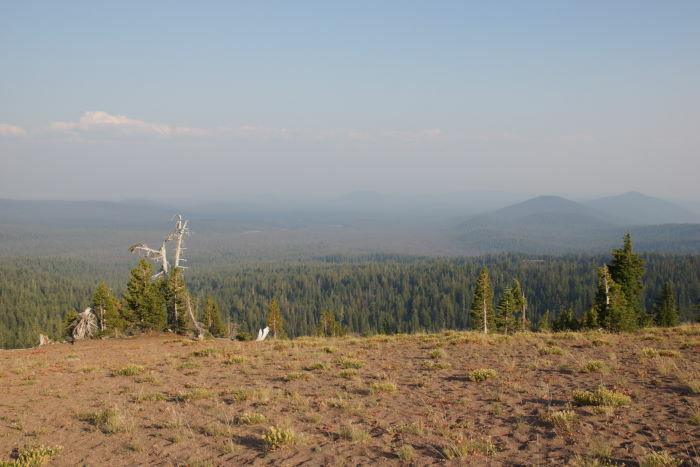 … where an old fire tower provides a great view of Wizard Island, directly below. A popular viewpoint is wedged between The Watchman and Hillman Peak. This spot gives you another good place to view Wizard Island. … I was fortunate enough to catch a rainbow over the lake. 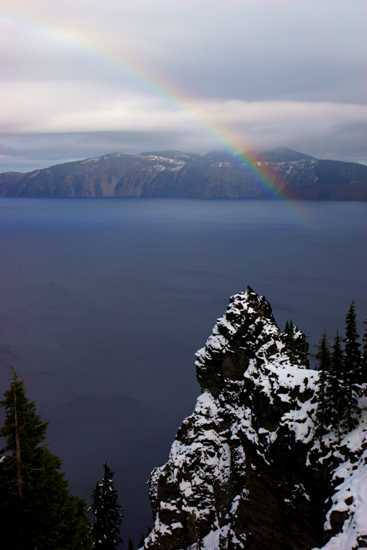 It was raining/snowing over the water, but the sun was still shining at the rim. It wasn’t long until the clouds thickened, and I had to call it a day. … into the Pumice Desert, north of the junction. There’s a nice view of Mount Thielsen here. … and the next great place to stop is Cleetwood Cove. 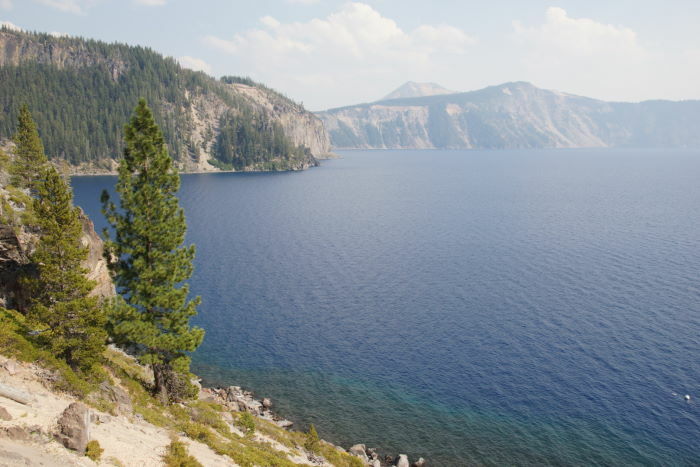 This is the only location where you can hike down to the lake itself. It’s also the place to catch a scenic cruise or shuttle boat out to Wizard Island. I took this picture about halfway down the trail. It’s about a mile from the road to the water, with a 600-foot elevation drop — and highly worth the moderate effort. If the lake was a clock, you’d find a few more great viewpoints around the 1 o’clock mark, in the area of Palisade Point. A second turnout provides a nice view of a mustard-colored cliff. … and again, to watch the sun set. All that smoke in the air made things, well, interesting. … watch for a side-road to Cloudcap Overlook. It only makes sense that I captured this great picture of one tiny cloud at Cloudcap. … you’ll be headed dead-on towards Mount Scott. At 8,929 feet, it’s the highest point in the park. 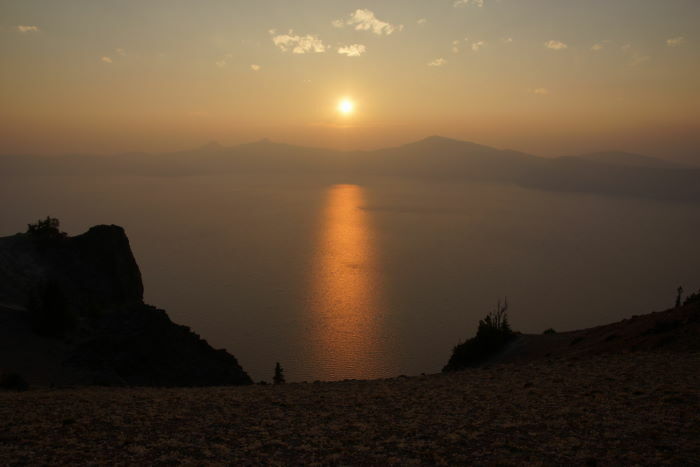 If I had an extra day at Crater Lake, I would have hiked to the top of Mount Scott. 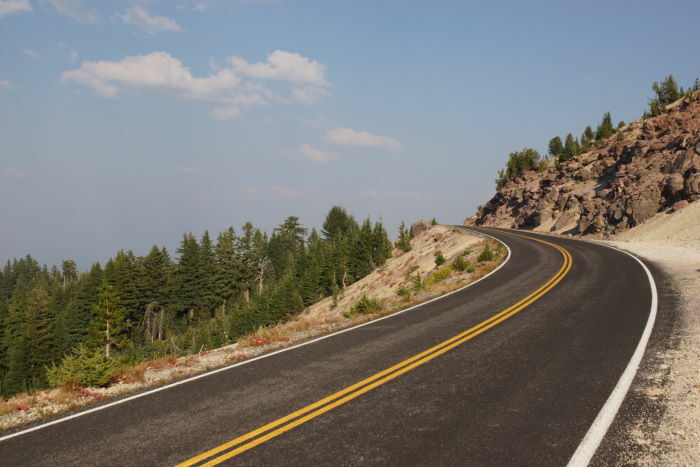 The 5-mile round-trip gains about 1,200 feet, so be prepared for a moderately exhausting climb. South of Cloudcap, you get a good view of the previous viewpoint at Pumice Castle. … and at another viewpoint, south of Victor View. 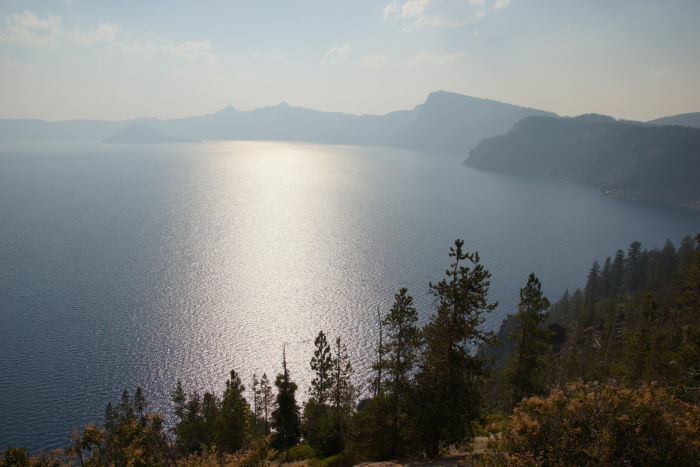 You’ll be able to see the tiny island known as Phantom Ship from several viewpoints, but a viewpoint at Kerr Notch provides the best up-close view. And while Phantom Ship looks great from here, the rest of the lake is somewhat obscured by trees. 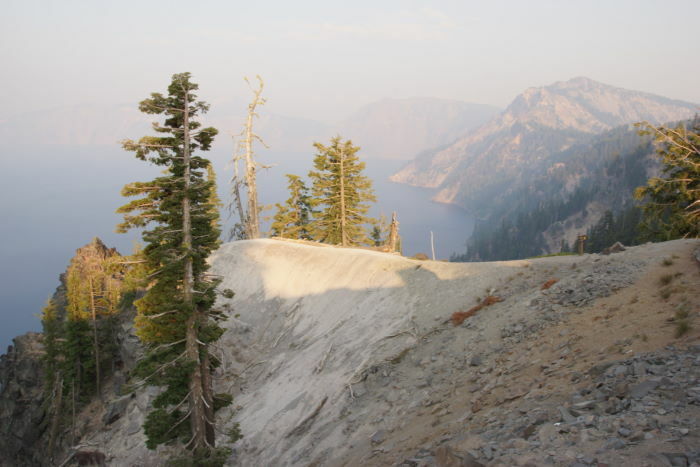 On the southeast side of the lake, the Rim Road heads away from the rim, and downhill a bit. 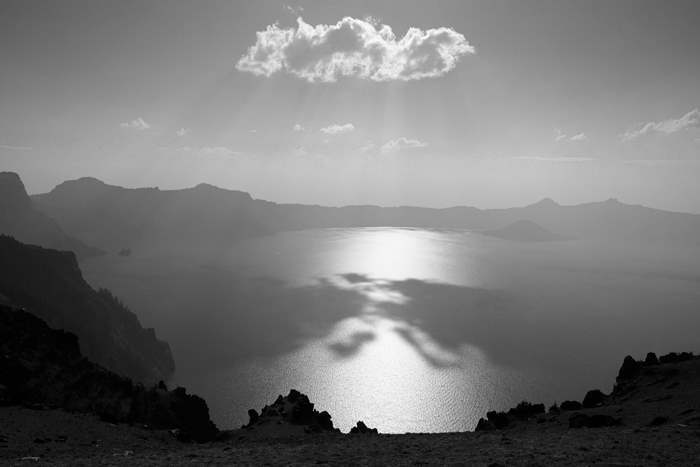 So, instead of lake views, you’ll be treated to the scenery in the opposite direction, towards the east. Also, keep an eye out for Vidae Falls. 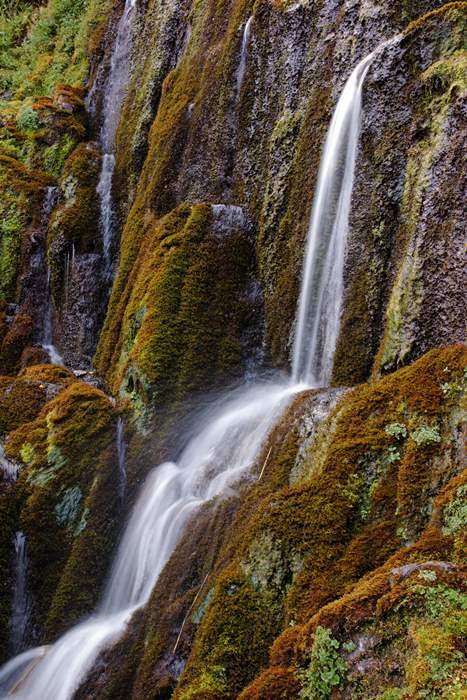 This small, delicate waterfall is perched on a cliff above the road. You’ll have to scramble up some loose rock to get a close look, but it’s worth the effort. 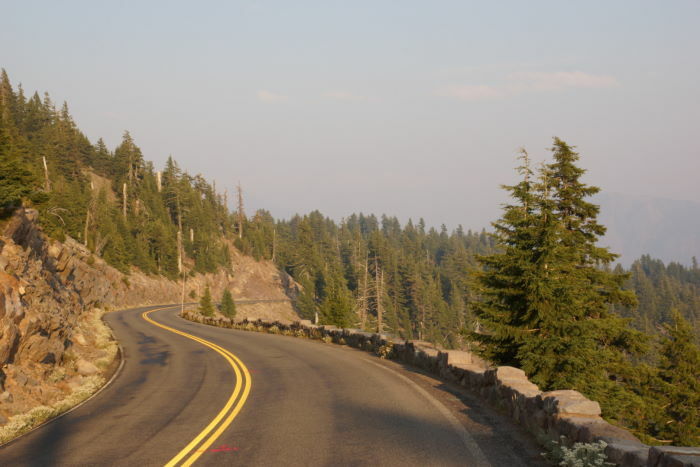 After Vidae Falls, the Rim Road twists and turns, until it reconnects with the south entrance road near the Steel Information Center — an alternative to the visitor center at the Rim Village. 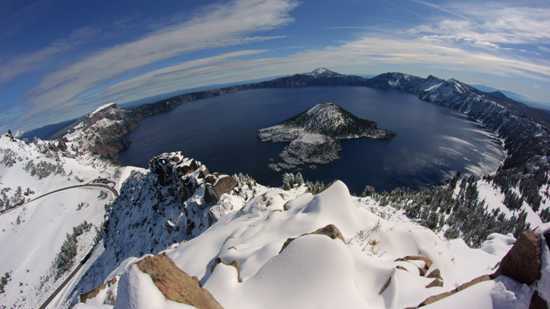 It’s worth the effort to go out-of-your-way to see Crater Lake during the brief window of warm weather which allows the park to open the Rim Road. If you’re fortunate enough to be there when the road is open, be sure to drive the whole thing.